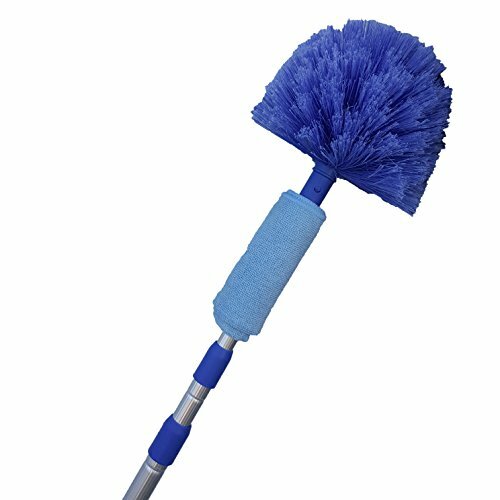 The long length of this blue cobweb duster with extension 6 feet when collapsed, 12 feet when extended add your height to that and you can reach up to 18 foot ceilings this will help you reach ceilings, corners, blinds, and other hard to reach areas. Dust on top of ceiling fans and hard to reach corners or behind furniture. EXTENSION POLE INCLUDED. Soft and long microfiber reach into small areas. Duster handle Click- Locks into extension pole. Easy to keep clean just gently wash in warm water with a little dish soap rinse and allow to air dry aching the high places to get rid of spider webs remove dust or just shine the top of the furniture you could never reach. With the 3 section extension this toll is very modular. Made of light weight aluminum the pole is light to hold but yet sturdy enough to push hard on the dirt.